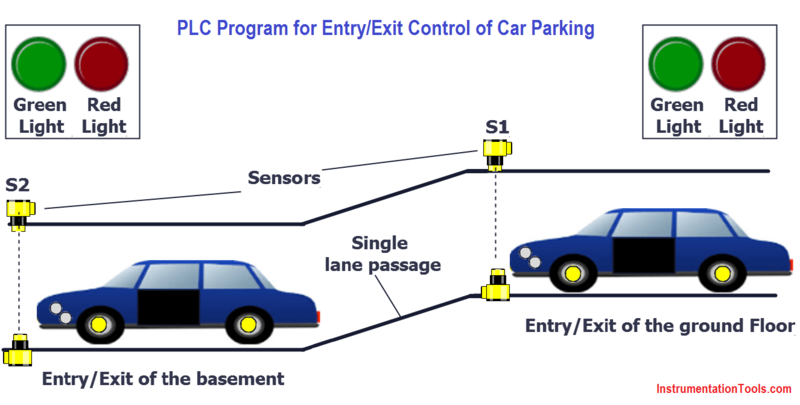 This is PLC Program for Entry/Exit control of the basement or underground car parking. Due to crowded area we face lots of problems of vehicle parking at basement or underground at shopping mall, hotels, complex etc. This is happening due to contradiction between the rapidly growing number of vehicles and limited parking spaces in malls, shop and complex in cities results in the phenomenon of “difficult parking and disorderly parking”. Current parking problem has serious impacts on people’s quality of life and the running of roads. By simple automation we can reduce the car parking problem at basement or underground in shopping mall, hotels, complex etc. The Entry/Exit at basement is a single lane passage and it needs traffic lights to control cars. Here we consider two lights indication for cars control. Red lights prohibit cars entering or leaving while green lights allow cars entering and leaving. When car enters at the passage from the entry of the ground floor, both red lights (ground floor and basement) will be ON. Other car entering and leaving is prohibited during the process till the car passes through the single passage. When passage is clear both green lights (ground floor and basement) will be ON and allow other cars entering from the ground floor or basement. In this application we have used Siemens S7-300 PLC and TIA Portal Software for programming. As per above explanation in first network when system is ON (I0.0), initially both green lights (ground floor (Q0.0) and basement (Q0.1)) will be ON. SET instruction is executed and it will set both output Q0.0 and Q0.1. RESET instruction is executed and it will reset both output Q0.2 and Q0.3. When car enters in the empty passage from the ground floor, sensor S1 (I0.1) will be triggered and with this trigger, memory coil M10.0 will be SET. When car enters in the empty passage from the basement, sensor S2 (I0.2) will be triggered and with this trigger, memory coil M10.3 will be SET. Both red lights will be set by either positive trigger of sensor S1 or sensor S2. Because when car enters in empty passage then both red lights (Q0.2 & Q0.3) will prohibit car entry/exit from both side. 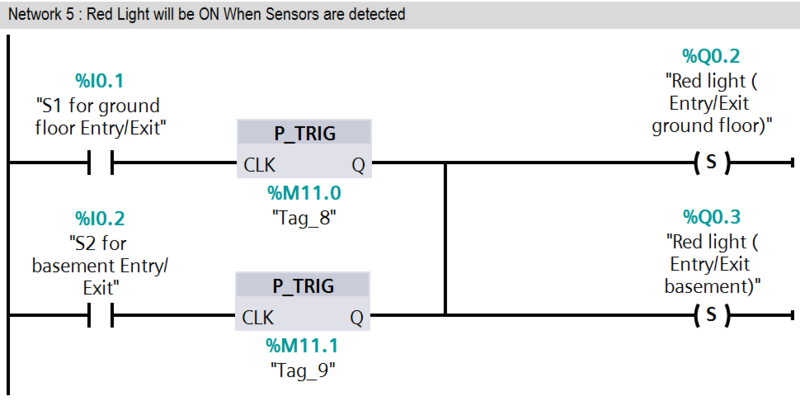 Here we have taken negative trigger of both sensor S1 (I0.1) and S2 (I0.2). so when they triggered red lights (Q0.2 & Q0.3) will be OFF. When car completely passes empty passage then red lights (Q0.2 & Q0.3) should be OFF. In this network green lights (Q0.0 & Q0.1) will be ON when red lights are OFF. Green lights (Q0.0 & Q0.1) allow other car for entry or exit. If red lights (Q0.2 & Q0.3) are ON at that time green lights (Q0.0 & Q0.1) should be OFF. 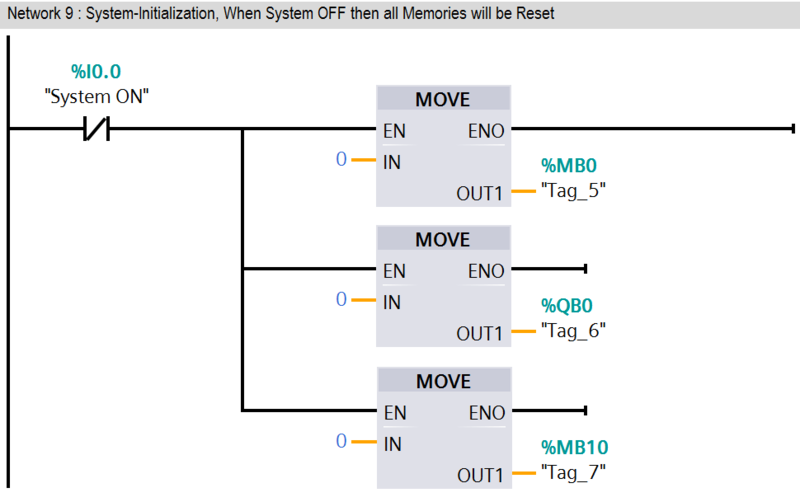 If system ON (I0.0) SWITCH is OFF then all memories should be 0.Here we have taken MOVE instruction for moving zero in all memories (MB0, QB0, and MB10). 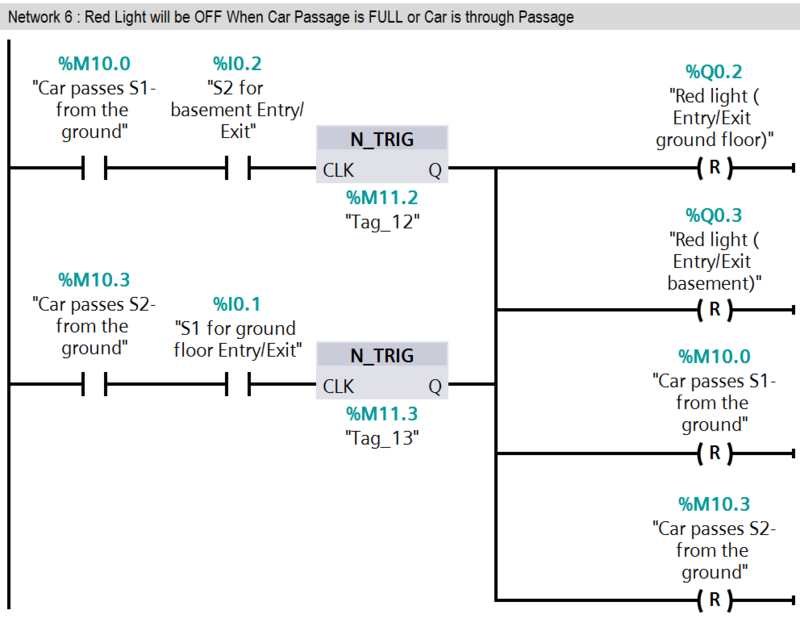 Note : The above PLC Logic provided for basic idea about application of PLC in Car Parking Control of Entry/Exit Gates. The Logic is limited and not complete application.